Get your spooky on because tonight is Halloween. Time for trick or treating and Halloween parties with crazy costumes. I recently joined the Queen Baking Club on Facebook, and this fortnight’s recipe was Halloween inspired in keeping with the season. The recipe is for Oozing Eyeball Marshmallow Slice. 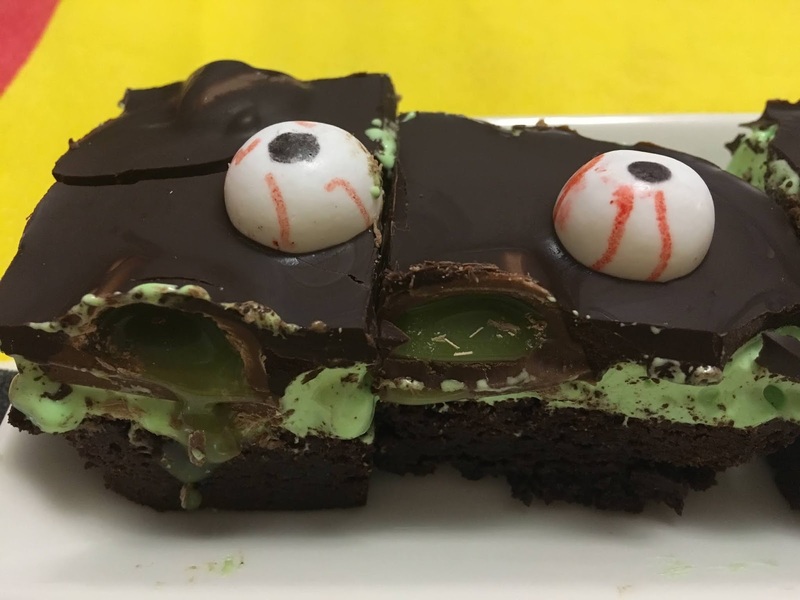 It comprises a brownie base with peppermint flavoured green marshmallow, studded with flowing Cadbury peppermint chocolate, then topped with dark chocolate and “eyeballs”. 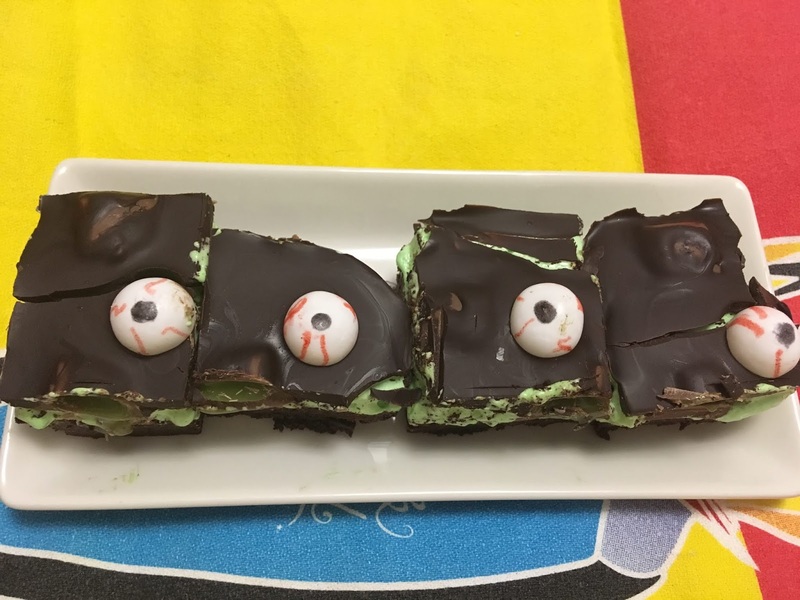 I used only one block of flowing peppermint chocolate rather than one and a half blocks, and made the eyeballs out of Kool Mints and edible markers rather than fondant. I really liked the end result, reminiscent of the traditional peppermint slice but with a twist. For our recent team lunch, in addition to the Strawberry Tart, I made a meringue roulade, which is a very easy gluten-free dessert. My research showed that the recipe for the meringue base is basically the same, whatever source you use. However, I was very taken with the presentation of Liliana Battle's Fig and Almond Roulade in her new(ish) book The Sweet Life - Home Baking and Sweet Treats Italian Style. Sadly, figs were not readily available to me, so I used mixed berries (raspberries and blueberries) instead. I think this is such a pretty dessert, and so light and airy to eat. The only disadvantage with it is that you need to eat it as soon as possible after filling it, because the meringue starts to weep. 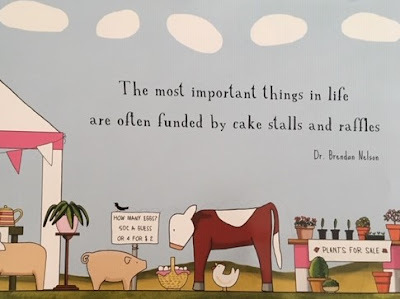 That means it is not the best dessert to prepare in advance, but I threw caution to the wind, as I had a half day's work ahead of me before our lunch and I needed to travel to get to the lunch. The meringue is filled with a lovely mix of whipped cream, toasted flaked almonds and fruit (in my case, berries, in Liliana's case, chopped fresh figs). Liliana also flavours the cream with honey rather than icing sugar, which gives that sweet honey taste to the dessert. Swoon! Preheat your oven to 180 degrees Celsius. Grease and line (with baking paper) a 30cm x 33cm baking tray. Whisk the egg whites in a stand mixer with the whisk attachment until foamy, then gradually beat in the sugar. Beat in the vanilla extract, and continue to beat until the meringue is thick and glossy, the sugar is fully dissolved, and stiff peaks form. Spread the meringue evenly over the prepared baking tray, and bake for 15 minutes or until puffed and golden. Remove the meringue from the oven and allow it to cool on the tray. For the filling, whip the cream until stiff peaks form. Fold through the honey and vanilla. To assemble, lay a piece of baking paper on the table that is bigger than the meringue. Sprinkle the baking paper generously with icing sugar (or caster sugar, if you prefer Liliana's method). Turn the meringue out onto the sugared baking paper and very carefully remove the baking paper that lined the tray in which the meringue was baked. Take it slowly as it has a nasty tendency to want to stick and tear. Spread three quarters of the whipped cream over the meringue, spreading nearly right up to the edges, then scatter over the 6 chopped figs or berries, and flaked almonds (reserving some berries and almonds for the top of the roulade). Starting at the long edge of the meringue closest to you, roll up the meringue tightly, using the baking paper to help you roll it up (without getting it caught in the roll). Once the meringue has been rolled into a log, carefully place it in a serving tray. Decorate the top of the roulade with dollops of the remaining whipped cream, the fig wedges or berries, and some flaked almonds. Drizzle with extra honey if desired. For Tim's birthday this year, we went to dinner at Matilda 159 Domain in South Yarra. This restaurant is named after the owner's daughter, and the "159 Domain" refers to its street address. Matilda 159 Domain specialises in grilled meats and seasonal produce, and is picturesquely situated across the road from the Botanical Gardens. The menu at Matilda is divided into starters, entrees, sides, mains and desserts. When all the elements are put together, you end up with the most satisfying, best tasting chicken sandwich you can imagine. I could have eaten two of these as a meal and be quite happy. The clam was fine, but the absence of strong flavours meant that it did not grab me as much as the bread with rillettes. This one was also a winner. I didn't know what to expect with ox tongue, but it tasted like a soft and lightly spiced sausage. This dish was delicate and flavourful, and the entrée size was perfect for me. The chef serves this steak cooked medium. Tim gave me a piece to try and it was good. This was a tasty side, which gave us some greenery with our meal, and the butter sauce was smooth and silky. We each ordered a glass of Pommeau de Normandie ($14) to drink with dessert. This blush-hued beverage is comprised of pressed apple cider and Calvados, and was the perfect accompaniment to our apple dessert. Service at Matildas was efficient and friendly, and the atmosphere was relaxed. I would definitely dine here again, given the chance. It was Tim's birthday recently, and I wanted to make him a special cake all of his own. White chocolate and raspberry are Tim's favourite flavours, so I wanted to make a cake for him featuring either or both of these flavours. Serendipitously, on the day that I was considering cake recipes, Helen Goh published a recipe for Raspberry Bitters Cake in the Good Weekend magazine in the newspaper. Perfect! Cake selection made. And what a handsome cake it is with its raspberry-glazed top. Helen was more enthused about the base cake, a spiced genoise-style cake. However, I had a "fight" with the cake. Version 1 sank in the middle, so that when I attempted to cut it into two layers, I ended up with a single thin layer and a crumbly mess. Given that this was meant to be a special occasion cake, I couldn't leave it there, so I went and bought more butter and stepped up to the plate for version number 2. This time, I didn't risk cutting the layers, and instead made two sandwich cakes - no cutting required. And ironically, they did not sink. This cake is delicious! The lightly spiced sponge cake layers harbour raspberries macerated in Angostura bitters, and are sandwiched together with whipped marscapone cream. A ruby red glaze made of icing sugar, raspberries and more Angostura bitters flows over the top of the cake, and a few more raspberries are used to decorate the top of the cake. Put the raspberries and Bitters from the filling into a small bowl and soak for an hour or overnight. When you are ready to make the cake, preheat your oven to 190C. Grease and line a 23cm round cake tin. Put the butter, orange peel, cinnamon, vanilla, star anise and cloves in a small saucepan over low heat. Once the butter has melted, remove the pan from the heat and leave to infuse until just lukewarm, then strain the butter through a sieve and discard the spices. Put the eggs and sugar into the bowl of a stand mixer fitted with the whisk attachment, and whisk until smooth and pale. Sift over the flour, baking powder and salt, and fold into the eggs with a rubber spatula until almost incorporated. Finally, slowly fold in the butter. Spoon the batter into the prepared cake tin and bake in the preheated oven for 35 minutes or until cooked through. Remove the cake from the oven and allow to cool completely in the tin on a wire rack. To make the glaze, put all of the ingredients into a food processor and blitz until smooth. Sieve the glaze to remove the seeds and store in the fridge until needed. To make the filling, whisk the cream, marscapone, vanilla and icing sugar together in the bowl of a stand mixer until soft peaks form. Chill in the fridge until required. Once the cake is completely cool, turn it out of the tin and slice it in half to create two layers. Put the bottom half of the cake onto on a cake board, and cover it with the raspberries soaked in Angostura bitters. Spread the cream filling over the raspberries, then top with the second cake layer. Pour the glaze over the top of the cake, then decorate with extra raspberries. For Tuesday with Dorie this week, the recipe is for cheesecake. This cheesecake is an American-style cheesecake that Dorie has Parisianised, and it has been a hit in both of her homes of Paris and New York - hence the "round trip". This cheesecake has a crushed cookies and almond meal crust, with more cookie crumbs in the filling. This cheesecake was meant to be made with 907g cream cheese. I balked at this, both from a cost perspective ($16 worth of cream cheese!!) and the sheer size perspective, so I halved the filling. The crust was meant to be made with Speculoos, but that is a little too exotic for the basic supermarket where I do most of my grocery shopping. Instead, I used Marie biscuits, but added ground cinnamon, ginger and nutmeg to the crushed biscuits to give them a Speculoos-like flavour. I also did not have almond essence, so I flavoured the filling with Queen passionfruit baking paste. This cheesecake was delicious - in fact, I am yet to meet a cheesecake that I do not like. Halving the filling gave me just the right amount of cheesecake, from my perspective. Dorie suggested serving this cheesecake with caramel sauce, but I thought it was perfect without. When looking in the window of pastry shops, one delicacy that always catches my eye is the fruit tarts. Traditionally, the fruit tart is a heavenly combination of shortcrust pastry, crème patisserie and glazed sliced fruit. The jewel of fruit tarts is the ruby red strawberry tart. How could anyone resist its luscious beauty? Accordingly, for a recent work team lunch, I wanted to make a strawberry tart. The challenge lay in the fact that one of my team members is a coeliac, so the tart had to be gluten free. The pastry tasted reminiscent of Arnotts Shredded Wheatmeal Biscuits. Whether you think that is good or bad is entirely a matter of personal opinion. For the filling, I used this recipe from the Australian Women's Weekly. The crème patisserie is thickened with wheaten cornflour, so I substituted rice flour on a one for one basis. I was not a huge fan of the resulting crème patisserie, which seemed a little too thick and a little eggy. My usual crème patisserie recipe, from Dorie Greenspan, only uses four egg yolks - did the extra yolk make a difference? Also, should I have used less rice flour than cornflour? Who knows, as I was locked into using the crème patisserie I had made (not wanting to waste all of those egg yolks). Although not everything went to plan with this tart, I think that the tart looked great and it tasted quite acceptable. Place the dry ingredients into a food processor and blitz to combine. Add the butter and egg and blitz again until a dough forms. Turn out the dough onto the bench, press into a flat disc and wrap in plastic wrap. Leave the dough to rest in the fridge for an hour before use. 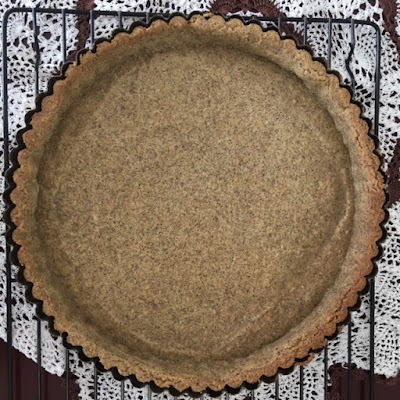 Spray the inside of a 23cm loose bottomed tart pan with spray oil. Remove the dough from the fridge and allow to soften on the bench for 10 minutes or so. Once the dough is able to be rolled without cracking, place the disc of dough between two pieces of baking paper and roll out to fit the tart pan. Line the tart pan with the dough and allow the tart shell to rest in the fridge for an hour. Preheat your oven to 180 degrees Celsius. Remove the tart shell from the fridge. Spray a piece of alfoil on the shiny side with spray oil and place it oiled side down in the tart shell. Pour uncooked rice or baking beans into the tart shell, and bake for 20 minutes. Remove the tart shell from the oven, take out the rice and alfoil, then return the tart shell to the oven to bake for another 10 minutes or til completely cooked. Remove the tart shell from the oven and place on a wire rack in the tine to cool. Heat the milk in a medium saucepan until it almost boils. Remove from the heat and stir through the vanilla extract. While the milk is heating, whisk the egg yolks and sugar together in a bowl until thick and pale. Whisk in the rice flour. While continuing to whisk the yolks, pour in quarter of the hot milk. Add the remainder of the milk to the mixture in a steady stream, whisking all the while. Return the mixture to the saucepan and heat, while continuously stirring, until the mixture almost boils and it thickens enough to coat the back of a spoon. Remove the mixture from the heat and strain to remove lumps, if necessary. Gently heat 1/4 cup strawberry jam in the microwave and strain to remove the seeds. Spread the base of the tart shell with jam. Scrape the crème patisserie into the tart shell and spread out evenly. Wash, hull and slice a 250g punnet of strawberries. Arrange the halved strawberries over the top of the tart. Heat a few tablespoons of quince jelly in the microwave and brush over the top of the strawberries to glaze them. Place the tart in the fridge for an hour or so to set before serving. For Tuesday with Dorie this week, I made Spiced Pumpkin Jammers. 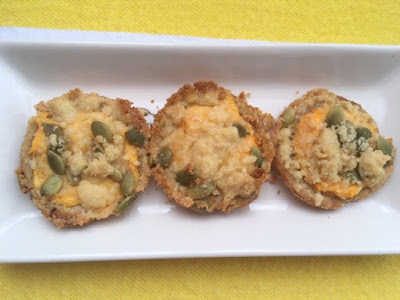 These are a spiced dough, topped with a mixture of mashed pumpkin and cream cheese, then topped with a layer of streusel laced with pumpkin seeds. These are not cookies that you make one night after work. These cookies demand a lazy afternoon at home, as there are numerous steps involved, with waiting time in between while you chill the dough and chill the streusel, rolling of a sticky dough, and fiddly toppings arranged in a muffin tin. I got 48 cookies out of the recipe - you can understand why I was over them by the time I finished making them. Undoubtedly, the finished result is delicious. However, these cookies are very fiddly and time consuming to make, which makes it unlikely that they will be popping up very often at my place. Every weekend, I look forward to seeing the new Helen Goh recipe in the Good Weekend supplement in the newspaper. I don't make all of them, or even want to, but many of Helen's recipes are very tempting. For the uninitiated, Helen co-wrote Sweet with Yottam Ottolenghi. Quite some time ago, she published a recipe for Moroccan Spiced Tea Loaf. I really enjoy this type of cake, with lots of dried fruit that is juicy from being soaked in tea. I have a similar recipe from years ago in one of mum's magazines. A slice of this loaf slathered with butter is just the ticket with a hot mug of coffee for afternoon tea. This cake is also a little different in that it is spiced with ras el hanout. The dried fruit into a heat proof bowl and pour over the tea. Cover the bowl, and leave overnight to soak. The next day, preheat your oven to 190 degrees Celsius. Grease and line a one litre loaf tin. Sift the dry ingredients together in a bowl, then stir in the brown sugar. Add the egg and dried fruit (including any liquid) and fold through the mixture. If the mixture is thicker than dropping consistency, add a little milk to the mixture. Spoon the mixture into the prepared loaf tin and bake for 50-55 minutes or until cooked through. Remove the loaf from the oven and allow to cool in the tin for 10 minutes before unmoulding onto a cooling rack to cool completely before slicing and serving, spread with butter. 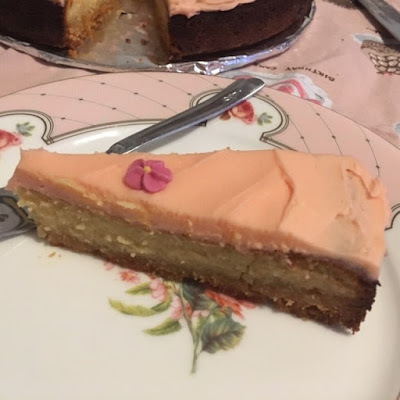 October is Breast Cancer Awareness Month, so the Red Tractor Recipe for October is pink - Pink Persian Cake. This month's Pink Persian Cake would do very well on a cake stall, because it is absolutely devine. It is nutty, moist (yeah, that's a good thing for cakes), pudding-like and all round just good to eat. Preheat your oven to 170 degrees Celsius, and line and grease a 23cm springform pan. Put the almond meal, sugars and butter in a food processor and blitz until the mixture resembles breadcrumbs. Divide the mixture in half, and put one half into the prepared cake tin, pressing down so that it covers the base evenly. To the other half of the mixture, add the eggs, yoghurt and nutmeg, and mix well. Pour this mixture over the base in the springform pan, and bake in the preheated oven for an hour or until cooked through. For the icing, beat the butter in a stand mixer until pale and creamy. Add the rosewater, rose colouring and 1 tablespoon of the icing sugar, then beat until combined. Add the remaining icing sugar, 1 tablespoon at a time (or not!) and beat in until smooth. Spread the icing over the top of the cake and decorate as desired. I enjoy looking through the free supermarket magazines for recipe ideas, and often come up with great new dishes to try. One of my favourites this last year has been the Italian Sausage and Barley Soup from the Coles magazine. This soup takes sausages that have been removed from their casings, and adds them to a flavourful soup of carrot, celery, pearl barley and tomatoes. It is both tasty and hearty. It is also very simple to make. Heat a large non-stick saucepan, and add the sausage. Cook the sausage, breaking it up into pieces as you go, until golden brown. Add the carrots and celery to the pan and cook until the vegetables are softened. Add the pearl barley to the pan, then add the tomatoes and stir to combine. Add the water to the pan and bring to the boil. Reduce the heat to medium to low, then cook, stirring occasionally, for 30 minutes until the soup thickens slightly. Add salt and pepper to taste, then serve with crusty bread. This is a perfect meal for a cold day, warming you on the inside. For Tuesday with Dorie this week, I made a pudding that was invented by the Alsatians to use up stale bread called Bettelman or "beggar". This is anything but a beggar's pudding though, as you need stale brioche to make it. At $5.50 a loaf, I don't consider brioche to be cheap. The brioche is soaked in milk, and eggs, apple, spices and calvados are added to the mix, then baked to produce a bread pudding. I was not much keen on this on day one served warm, as it seemed a little dry to me. However, after a day in the fridge, the Bettelman was a different beast, and had come together to be quite moist in the middle. I recommend eating the Bettelman cold after it has had a day or two in the fridge. 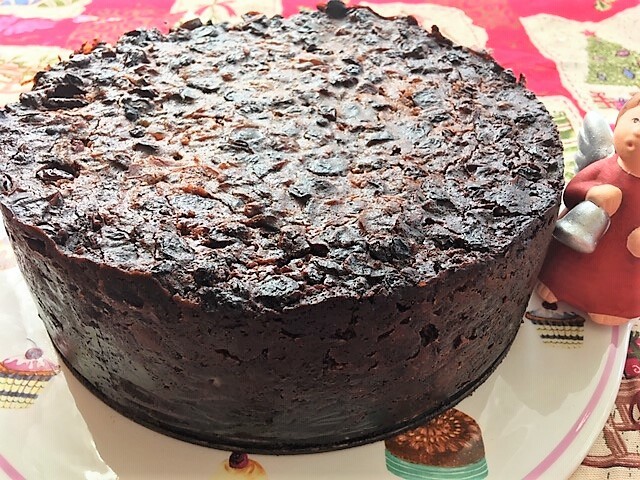 It will soon be Stir It Up Sunday, the day when people traditionally make their Christmas cakes and puddings so that they have time to mature for Christmas. 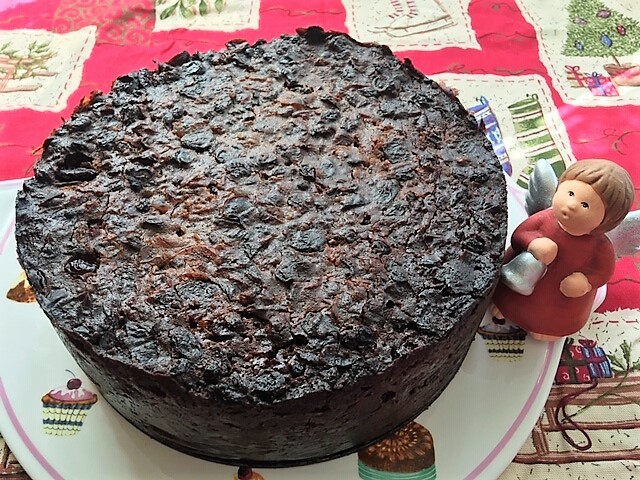 I decided to take a jump on them by making my Christmas cake this weekend. 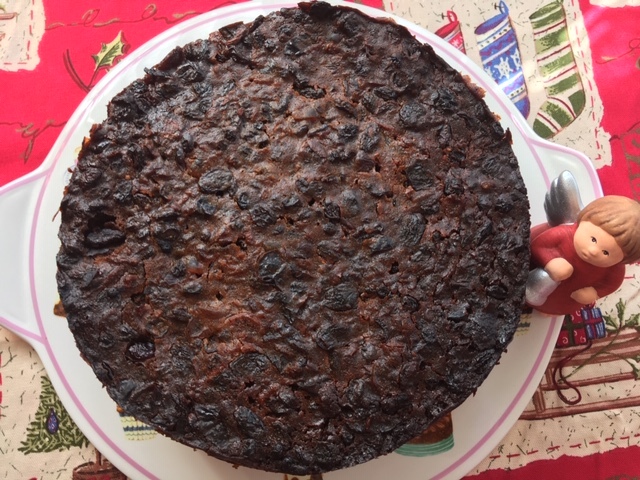 Every year, I try to make a different Christmas cake recipe. The results are mixed, but the unknown is part of the fun. This year, I chose a recipe from Maggie Cooper that I found in The Toowoomba Chronicle, but which is also reproduced here. My fruit mince had been happily soaking in brandy for around three weeks, so I was confident that it was time to make the cake. 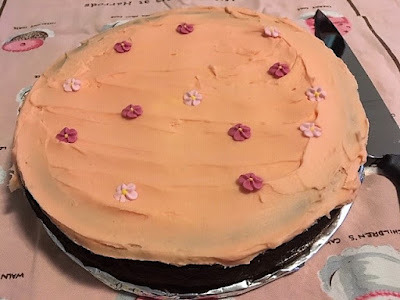 The other key change that I made to the recipe is to use a commercial gluten free flour mix in place of the plain flour, as some of my recipients are eating gluten-free. I am a little nervous as to whether this will make the cake crumbly when sliced, but I won't find out for a few weeks yet. The cake seemed to hold together well once it had cooled and was unmoulded, so I am hopeful that it will be just fine. Peel, core and grate the apples. Chop the larger fruit finely. Put everything into a big plastic mixing bowl with a lid, and shake well to combine. Keep the container in a dark place and shake every few days for at least four weeks (or three, in my case). Grease and line the base and sides of a 25cm round cake tin with baking paper and preheat your oven to 150°C. In a stand mixer, beat the butter until pale and creamy, then beat in the brown sugar until well combined. Beat in the eggs, one at a time, followed by the the chocolate, essences, glucose, jam, lemon zest and lemon juice. In a separate bowl, sift the flour, mixed spice, ground ginger and salt together. Add 1/3 fruit mince to the cake batter, then 1/3 of the dry ingredients, and fold in gently with a wooden spoon. Repeat twice more until all of the dry ingredients and fruit mince have been incorporated into the batter. Scrape the cake batter into the prepared cake tin, and tap on the bench a few times to remove any air pockets. Tie a triple thickness strip of newspaper around the tin with string (this will help to prevent the outside of the cake burning). Bake the cake in the centre of the oven for 3 to 3 and 1/2 hours or until cooked through. Take the cake out of the oven and prick the top of it all over with a fine skewer. Pour the additional half a cup of brandy over the top of the cake. Take the newspaper off the cake tin and allow the cake to cool completely in the tin. Once cooled, take the cake out of the tin, but leave the baking paper on (I disobeyed this so I could photograph my cake). Wrap the cake in a double layer of alfoil and store in an airtight container in a dark cool place for at least a month before Christmas. You can ice the cake with royal icing or marzipan and fondant before serving, if desired.